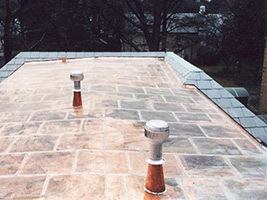 The Slate and Tile Roofing Company can handle all of your Copper Roofing Needs. Copper’s longevity is legendary. Almost all of the copper produced throughout time is still in use. In addition to being 100% recyclable, most architectural copper produced today has a recycled content of nearly 75%. 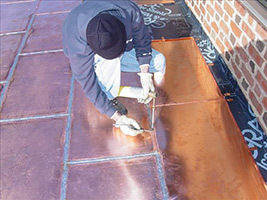 Thus, not only is copper the best choice to protect a structure, it’s also the best choice to protect the environment. Whether you are looking for Standing Seam Copper Roofing or Flat-Lock Copper Roofing The Slate and Tile Roofing Company can meet all of your needs. 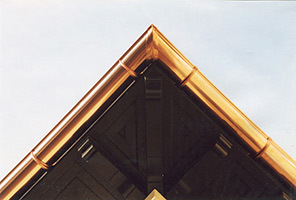 If it is copper gutters you are looking for, we do it all, from custom box gutter to one of a kind formed gutters. We install one of the strongest half round copper gutters on the market today manufactured in the U.S.A. by Classic Gutters.